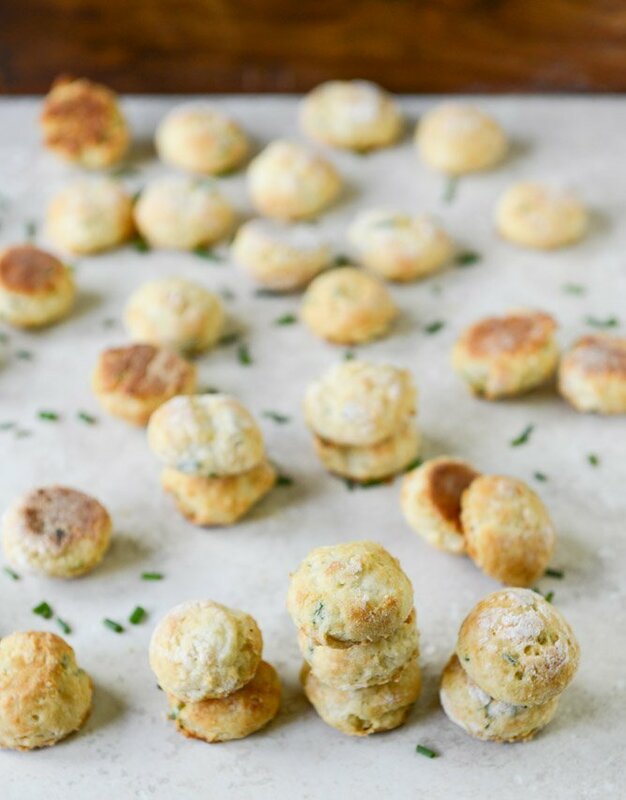 Mini Cream Cheese + Chive Biscuits. Everything is better when tiny. This is what you get when you combine a few ingredients (chives, cream cheese) that you don’t really care about: something wildly delicious. I am alllll over them. What? Doesn’t everybody cut their mini biscuits with an amaretto bottle top? After patting out my dough, I realized that I didn’t have something mini to make my oh-so mini biscuits. I ran around like a wild woman for a few moments before looking at all the booze in the bar and deciding that yes, this top on the amaretto bottle will work just fine. Twenty minutes later I realized I could have used something like the lid from one of my spices, such as smoked paprika or cumin or whatever but… oh well. This gave me an excuse for a cocktail. So. I think I now enjoy mini biscuits better than regular biscuits. Not only can you eat more (mini = eat as many as you want, calorie free, duh) but you can just pop ’em in your mouth! And they are perfect for side dishes and things like soups and stews and summery salads. 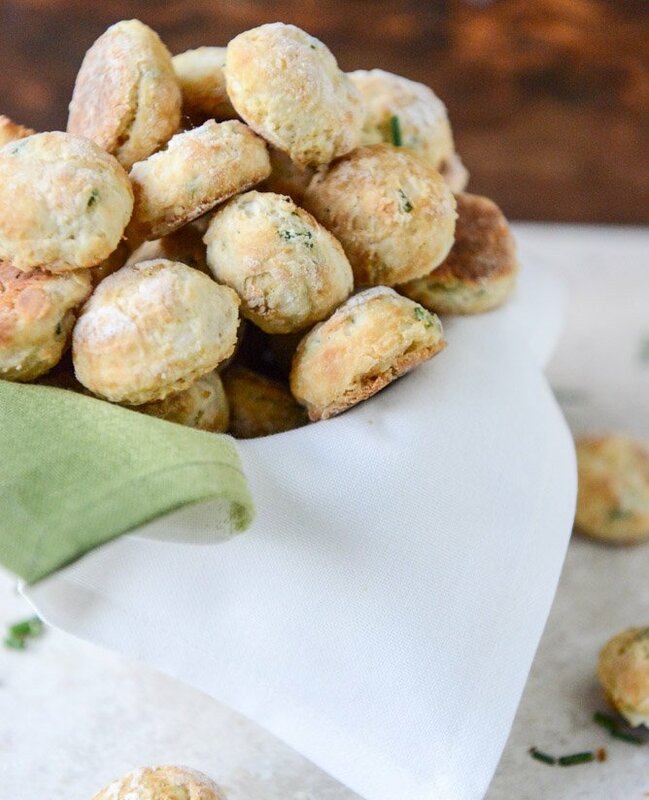 Like biscuit croutons if you will. You know, I don’t even think I ate real biscuits until I was a teenager? They were one of my favorite things but not something my mom would make often. Unless we are talking about Grands in a can… which ummm, I still sort of love. Not gonna lie. But back in the day, I was biscuitless. And we’re talking for most of my life. Long ago. Like the days when I thought Comic Sans was a professionally acceptable font. I made these little biscuits because they come as part of one of my favorite local restaurants’ bread baskets. And I am not a bread basket gal. You should know that by now. I can totally take it or leave it unless it is GOOD bread. But this… this is bread stuffed with soft whipped cream cheese. The little buttons practically melt in your mouth. I think I single-handedly consumed like 25 of them. In a large bowl, combine flour, baking powder and soda, salt and chives, stirring well to coat. Using your hands, a fork or a pastry blender, add the butter and mix until coarse crumbles form. I like to use my hands for this and I spend about 5 full minutes rubbing the butter and flour through my fingers until the consistency is the same throughout the mix. Once finished, add in the cream cheese in spoonfuls. You’re going to do the same as you did with the butter – but you don’t want to mix the cream cheese in as much. A spoon works better here and just combine it until there are a few larger chunks of cream cheese and it’s worked into the flour. Add the buttermilk and stir until it is JUST combined – do not overmix! 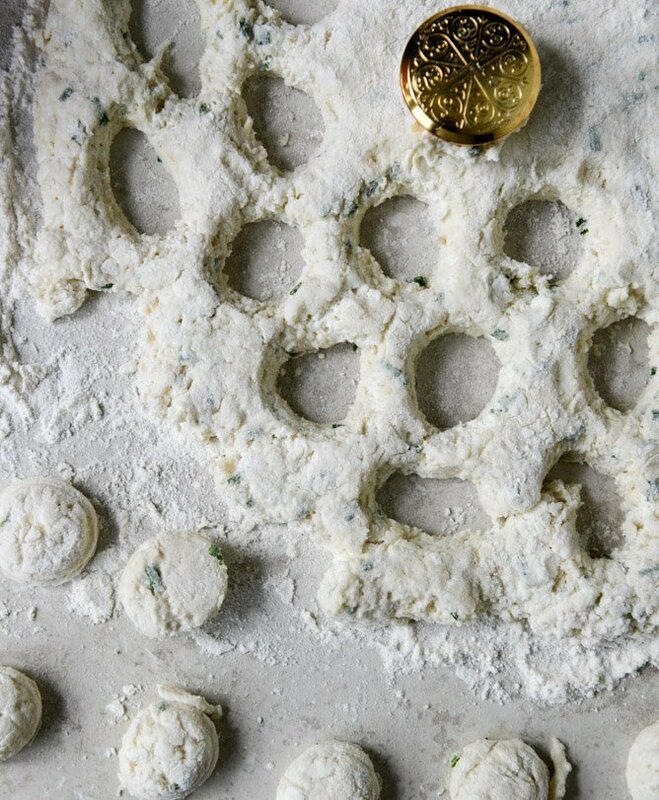 Add some flour to your workspace and place the dough on top. I sprinkle some additional flour on top of the dough, then use my hands and pat it into a circle that is about one inch thick. Take a small biscuit cutter or even the (clean) lid to one of your spice containers and cut the biscuits into rounds. You want to use an instrument that is roughly one inch in diameter. Place on a nonstick baking sheet. Bake for 6-8 minutes, until slightly golden. These are best served warm when the cream cheese is still soft! I tried to take a bite picture for you buuuut… I just kept eating them. I love this – I have a co-worker who uses Comic Sans as her email font. We work in a really professional (not artsy, not fun, we’re not kindergarten teachers) industry and it is SO not appropriate. Just WEIRD. Love the idea with the Armaretto cap. Sometimes you just have to improvise from 3girls1apple. Anything with cream cheese and I’m in! Just eat one or two?? These are the perfect party treat (which means I could also finish them off before the party begins). I love the cap; I’m having to be a bit creative with tools since many of mine are currently stored…this might come in VERY handy. I adore tiny food :) so easy to eat, so nice to look at! These look and sound delicious! Heey, I was wondering…is there a substitute for buttermilk ( I read on some sites that vinegar for milk can do). ? 1 teaspoon lemon juice or vinegar to 1 cup milk. Let it sit a few minutes and you’ve got buttermilk! Oh how cute are these! I love the amaretto-top-as-biscuit-cutter idea. Good thinking! Mmm . . . I’ve got some chives in the garden and cream cheese in the fridge. Can’t wait to try these little ones. Love your improvisation on the biscuit cutter! i just made these tonight! they’re delicious cute aanndd super cute! thanks so much for sharing! 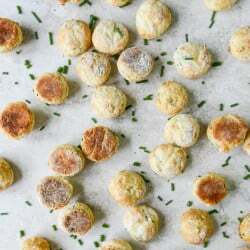 I am obsessed with the biscuits at Spoon and have been wondering how to replicate them–this looks like a great recipe! Thanks! These look amazing. Can’t wait to try them real soon. I love your blog. hi sarah – sorry these didn’t turn out the way you hoped. did you make sure to use unsalted butter? 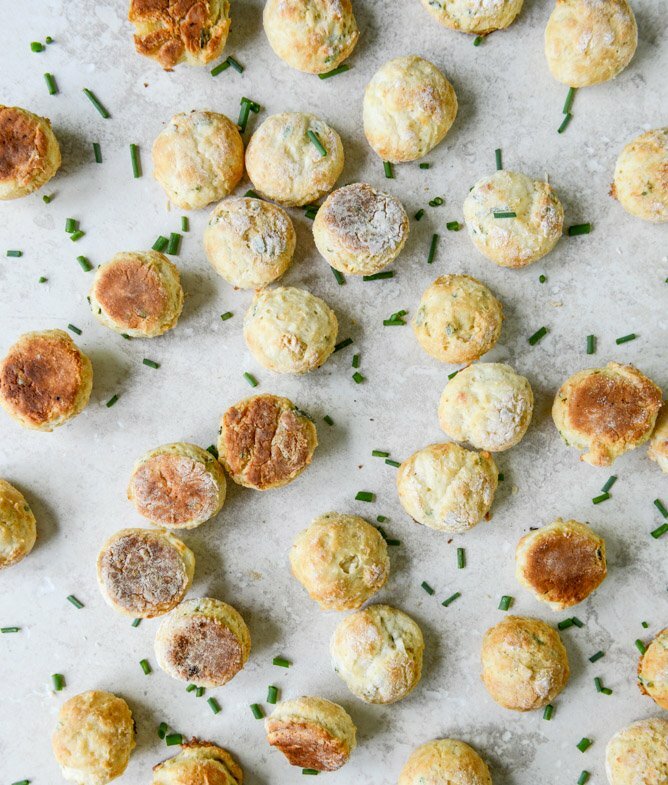 most biscuit recipes call for 2 or even 3 times the salt in this recipe, so it shouldn’t be overly salty with the 1 teaspoon. I have a feeling you may have used unsalted butter as Sarah mentioned or you may have confused tsp and Tbls that tends to happen sometimes, the only other thing I can think of is the saltiness of the cream cheese which could affect it as well. Made these last night and used a square biscuit cutter. Delicious and cute! Can you make the dough ahead of time ?